A group of citizen scientists and professional astronomers, including Carnegie’s Jonathan Gagné, joined forces to discover an unusual hunting ground for exoplanets. 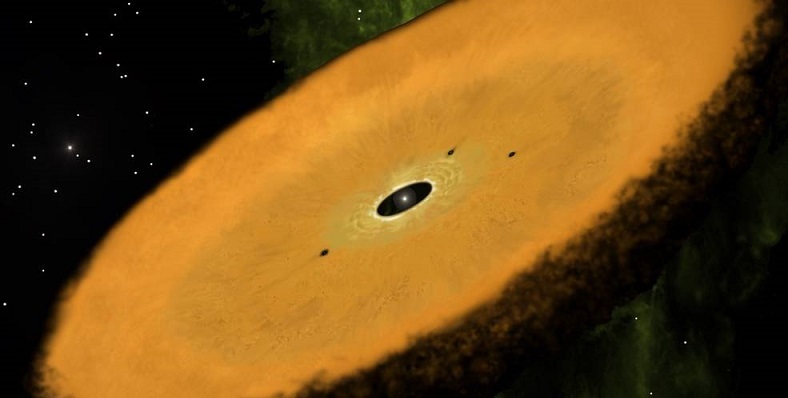 They found a star surrounded by the oldest known circumstellar disk—a primordial ring of gas and dust that orbits around a young star and from which planets can form as the material collides and aggregates. The discovery relied on citizen scientists from Disk Detective, a project led by NASA/GSFC's Dr. Marc Kuchner that’s designed to find new circumstellar disks. At the project’s website, DiskDetective.org, users make classifications by viewing ten-second videos of data from NASA surveys, including the Wide-field Infrared Survey Explorer mission (WISE) and Two-Micron All Sky Survey (2MASS) projects. Since the launch of the website in January 2014, roughly 30,000 citizen scientists have participated in this process, performing roughly 2 million classifications of celestial objects. “Unraveling the mysteries of our universe, while contributing to the advancement of astronomy, is without a doubt a dream come true,” says Hugo Durantini Luca from Argentina, one of eight citizen scientist co-authors. Carnegie’s Gagné devised a test that showed this newly found red dwarf and its disk are likely part of the Carina association, which was key to revealing its surprising age. “It is surprising to see a circumstellar disk around a star that may be 45 million years old, because we normally expect these disks to dissipate within a few million years,” Gagné explained. “More observations will be needed to determine whether the star is really as old as we suspect, and if it turns out to be, it will certainly become a benchmark system to understand the lifetime of disks."